AccuShred is your partner in the important task of secure information destruction and disposal. We remove the worry by providing an unbroken chain of custody for your sensitive materials. From the moment your employees place materials into one of our secure containers until the shreds are co-mingled and baled for recycling, your materials are under our professional care and supervision. Additionally, with our monthly newsletter, the Data Destruction News, we keep you up to date on the latest legislation, regulations, and technology in the rapidly changing field of secure information destruction and identity theft. Our newsletter features articles relating to regulations such as HIPAA, FACTA, HITECH, and GLB, as well as timely articles about electronics recycling and identity theft prevention. Outstanding customer service sets AccuShred apart. We go the extra mile to create and administer a dependable program that’s right for you and your business. We come when you call, and if we ever miss a scheduled appointment, that service is free! 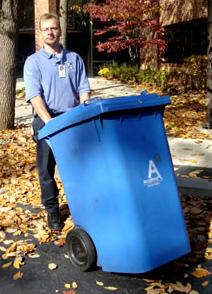 AccuShred is locally owned and operated. Our owners, management team, and employees all live, work and play in the communities we serve. No aspect of this business is ever outsourced, unlike the multi-national companies that compete in this market. You always get a familiar voice on the phone, and if you ever need to speak with ownership, just ask.